NASC President Alan Skelton, state accounting officer of Georgia, recently welcomed association members and corporate partners to Atlanta for the thirty-eighth annual conference of the National Association of State Comptrollers. The conference, which was held March 13-15, featured record attendance of 184. The conference was preceded by meetings of NASACT’s Executive Committee, NASC’s Executive Committee, the Committee on Accounting and Financial Reporting and several user groups. The conference was also preceded by a meeting of the Governmental Accounting Standards Advisory Council and a GASB hear on the Financial Reporting Model Improvements project. The conference featured three roundtable sessions and various general sessions covering a range of topics. View the complete program and download presentations and speaker bios. NASC selected a new Executive Committee at the 2019 business meeting. 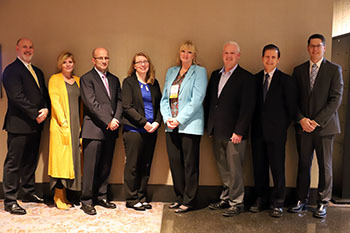 Left to right: Doug Cotnoir (ME), Cheryl Grey (MT), Alan Skelton (GA, immediate past president), Stacy Neal (MO, president), Lynne Bajema (OK, secretary/treasurer), Brandon Woolf (ID, vice president), Bob Jaros (CO) and Robert Hamilton (OR). 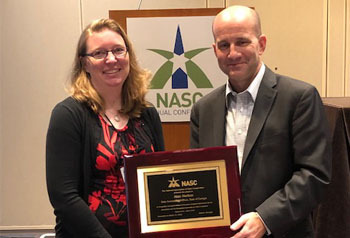 For her first order of business, new NASC President Stacy Neal presented a plaque of appreciation to Alan Skelton for his year of service to the association and its members. 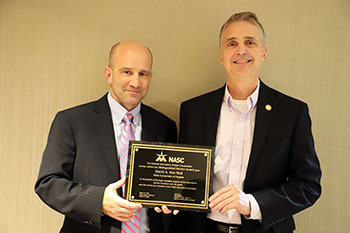 Martin J. Benison, former state comptroller of Massachusetts and current director of state and local government with Accenture, received NASC’s highest honor, the Louis L. Goldstein Distinguished Leadership Award. David A Von Moll, state comptroller of Virginia, received a Distinguished Service Award. Lynne Bajema, state comptroller of Oklahoma, received the 2018 President's Award. Kim O'Ryan, NASC association director, received a Special Recognition Award. Two resolutions were approved during the conference, thanking President Skelton for his service, and one recognizing NASC Past President Anna Maria Kiehl, state comptroller of Pennsylvania, who announced her retirement at the conference. 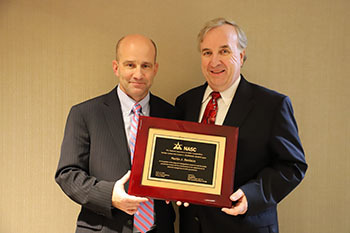 Martin J. Benison (right) accepted the Louis L. Goldstein Distinguished Leadership Award from President Alan Skelton. David A. Von Moll (VA) received the NASC Distinguished Service Award from Skelton during the conference banquet. Lynne Bajema (OK) accepted the President's Award from Skelton. NASC wishes to thank all those who helped with the conference, especially Program Committee Chair Stacy Neal. NASC also wishes to thank all the speakers and moderators for sharing their time and expertise. Special gratitude goes to each corporate partner at the conference for their financial support and technical expertise.